From 9-11 December 2006 the 3rd Arab Water conference took place in Cairo. In collaboration with GWA, The Egyptian National Water Research Center organised a special gender session, which was very well attended (100 out of the in total 371 participants of the conference). 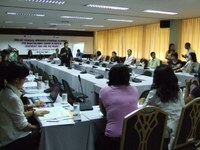 Six presentations were given on different aspects of gender mainstreaming in water management. After every presentation, interesting and ample discussions took place, only stopped because of time constraints. Download the presentation of the Executive Director of GWA, Joke Muylwijk here. Download the presentation of GWA representative Mrs. Soumaya Ibrahim here.